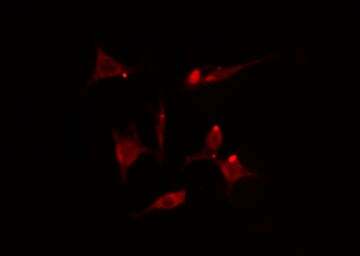 Function: Adapter protein implicated in the regulation of a large spectrum of both general and specialized signaling pathways. Binds to a large number of partners, usually by recognition of a phosphoserine or phosphothreonine motif. Binding generally results in the modulation of the activity of the binding partner. Negative regulator of osteogenesis. Blocks the nuclear translocation of the phosphorylated form (by AKT1) of SRPK2 and antagonizes its stimulatory effect on cyclin D1 expression resulting in blockage of neuronal apoptosis elicited by SRPK2. Negative regulator of signaling cascades that mediate activation of MAP kinases via AKAP13. Subunit Structure: Homodimer (PubMed:17717073). Interacts with SAMSN1 and PRKCE (By similarity). Interacts with AKAP13 (PubMed:21224381). Interacts with SSH1 and TORC2/CRTC2 (PubMed:15454081, PubMed:15159416). Interacts with ABL1; the interaction results in cytoplasmic location of ABL1 and inhibition of cABL-mediated apoptosis (PubMed:15696159). Interacts with ROR2 (dimer); the interaction results in phosphorylation of YWHAB on tyrosine residues (PubMed:17717073). Interacts with GAB2 (PubMed:19172738). Interacts with YAP1 (phosphorylated form) (PubMed:17974916). Interacts with the phosphorylated (by AKT1) form of SRPK2 (PubMed:19592491). Interacts with PKA-phosphorylated AANAT (PubMed:11427721). Interacts with MYO1C (PubMed:24636949). Interacts with SIRT2 (PubMed:18249187). Interacts with the 'Thr-369' phosphorylated form of DAPK2 (PubMed:26047703). Interacts with PI4KB, TBC1D22A and TBC1D22B (PubMed:23572552). Interacts with the 'Ser-1134' and 'Ser-1161' phosphorylated form of SOS1 (PubMed:22827337). Interacts (via phosphorylated form) with YWHAB; this interaction occurs in a protein kinase AKT1-dependent manner (PubMed:15538381). Interacts with SLITRK1 (PubMed:19640509). Interacts with SYNPO2 (phosphorylated form); YWHAB competes with ACTN2 for interaction with SYNPO2 (By similarity). Interacts with RIPOR2 (via phosphorylated form) isoform 2; this interaction occurs in a chemokine-dependent manner and does not compete for binding of RIPOR2 with RHOA nor blocks inhibition of RIPOR2-mediated RHOA activity (PubMed:25588844). Post-translational Modifications: The alpha, brain-specific form differs from the beta form in being phosphorylated. Phosphorylated on Ser-60 by protein kinase C delta type catalytic subunit in a sphingosine-dependent fashion. 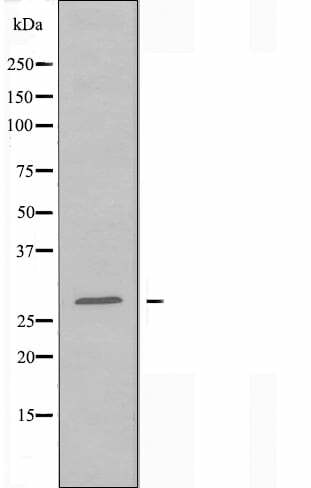 Western blot analysis of extracts from HepG2 cells using 14-3-3 beta antibody. MBS9604947 staining HepG2 cells by IF/ICC. The sample were fixed with PFA and permeabilized in 0.1% Triton X-100, then blocked in 10% serum for 45 minutes at 25 degree C. The primary antibody was diluted at 1/200 and incubated with the sample for 1 hour at 37 degree C. An Alexa Fluor 594 conjugated goat anti-rabbit IgG (H+L) antibody, diluted at 1/600, was used as secondary antibody.